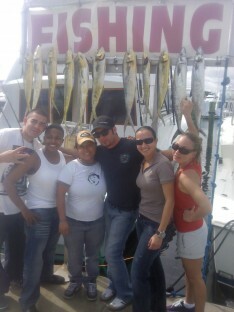 I had special guests on board the Happy Day Today for a deep sea fishing charter out of Fort Lauderdale FL– Paula DaSilva, finalist on the Fox TV’s Hell’s Kitchen and Executive Chef of the world renown Eden Roc Renaissance Hotel Restaurant, 1500°, http://www.1500degreesmiami.com/ along with Sous Chef Tony Velazquez and Adrienne Grenier and friends. It was another typical gorgeous day here inFort LauderdaleFL, temperature in the low 80’s, sunny, winds out of the southeast 5-7 mph. Our main objective was to catch eating fish, specifically Mahi Mahi’s and Whahoo’s. Fort Lauderdale charter boat “Happy Day Today” is a 46’ Hatteras with twin Detroit Diesel power cruising at 18 knots. On your charter, we are able to run offshore to deep water to target the bite or whatever it takes to make sure your Fort Lauderdale fishing charter is a successful and fun experience.